Fog is a collection of liquid water droplets or ice crystals suspended in the air at or near the Earth's surface. Fog can be considered a type of low-lying cloud, and is heavily influenced by nearby bodies of water, topography, wind conditions, and even human activities. 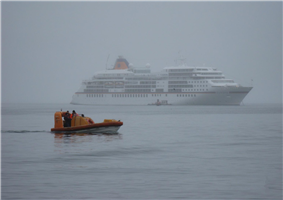 In turn, fog has affected many human activities, such as shipping and transport, warfare, and culture. For aviation purposes in the UK, a visibility of less than 5 kilometres (3.1 mi) but greater than 999 metres (3,278 ft) is considered to be mist if the relative humidity is 70% or greater; below 70%, haze is reported. Fog forms when the difference between air temperature and dew point is generally less than 2.5 °C or 4 °F. Fog begins to form when water vapor condenses into tiny liquid water droplets suspended in the air. The main ways water vapor is added to the air: wind convergence into areas of upward motion; precipitation or virga falling from above; daytime heating evaporating water from the surface of oceans, water bodies, or wet land; transpiration from plants; cool or dry air moving over warmer water; and lifting air over mountains. Water vapor normally begins to condense on condensation nuclei such as dust, ice, and salt in order to form clouds. Fog, like its elevated cousin stratus, is a stable cloud deck which tends to form when a cool, stable air mass is trapped underneath a warm air mass. Fog normally occurs at a relative humidity near 100%. This occurs from either added moisture in the air, or falling ambient air temperature. However, fog can form at lower humidities, and fog can sometimes fail to form with relative humidity at 100%. A reading of 100% relative humidity means that the air can hold no additional moisture; the air will become supersaturated if additional moisture is added. Fog can form suddenly, and can dissipate just as rapidly, depending whether the temperature is below or above the dew point, respectively. The sudden formation of fog is known as "flash fog". The thickness of a fog layer is largely determined by the altitude of the inversion boundary, which in coastal or oceanic locales is also the top of the marine layer, above which the airmass is warmer and drier. The inversion boundary varies its altitude primarily in response to the weight of the air above it which is measured in terms of atmospheric pressure. The marine layer and any fogbank it may contain will be "squashed" when the pressure is high, and conversely, may expand upwards when the pressure above it is lowering. Depending on the concentration of the droplets; visibility in fog can range from the appearance of haze, to almost zero visibility. 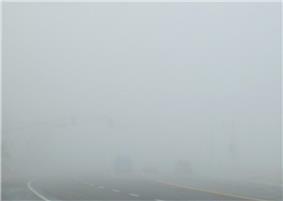 Many lives are lost each year worldwide from accidents involving fog conditions on the highways. The Aviation Travel Industry is affected by the severity of an existing fog condition. Even though modern auto-landing computers can put an aircraft down without the aid of a pilot, those manning an Airport Tower must be able to see if aircraft are sitting on the runway awaiting takeoff, thus during extreme fog conditions, safe landings are impossible and airports are closed until fog conditions improve. Shadows are cast through fog in three dimensions. The fog is dense enough to be illuminated by light that passes through gaps in a structure or tree, but thin enough to let a large quantity of that light pass through to illuminate points further on. As a result, object shadows appear as "beams" oriented in a direction parallel to the light source. These voluminous shadows are due to the same cause as crepuscular rays, which are the shadows of clouds, but in this case, they are the shadows of solid objects. Radiation fog is formed by the cooling of land after sunset by thermal radiation in calm conditions with clear sky. The cool ground produces condensation in the nearby air by heat conduction. In perfect calm the fog layer can be less than a meter deep but turbulence can promote a thicker layer. Radiation fogs occur at night, and usually do not last long after sunrise, but they can persist all day in the winter months especially in areas bounded by high ground such as the Vale of York in England. Radiation fog is most common in autumn and early winter. 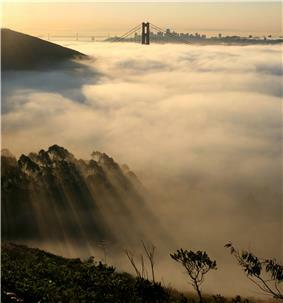 Examples of this phenomenon include the Tule fog. Ground fog is fog that obscures less than 60% of the sky and does not extend to the base of any overhead clouds. However, the term is usually a synonym for radiation fog. Advection fog occurs when moist air passes over a cool surface by advection (wind) and is cooled. It is common as a warm front passes over an area with significant snow-pack. It is most common at sea when moist air encounters cooler waters, including areas of cold water upwelling, such as along the California coast (see San Francisco fog). The advection of fog along the California coastline is propelled onto land by one of several processes. A cold front can push the marine layer coast-ward, an occurrence most typical in the spring or late fall. During the summer months, a low pressure trough produced by intense heating inland creates a strong pressure gradient, drawing in the dense marine layer. Also during the summer, strong high pressure aloft over the desert southwest, usually in connection with the summer monsoon, produces a south to southeasterly flow which can drive the offshore marine layer up the coastline; a phenomenon known as a "southerly surge", typically following a coastal heat spell. However, if the monsoonal flow is sufficiently turbulent, it might instead break up the marine layer and any fog it may contain. Moderate turbulence will typically transform a fog bank, lifting it and breaking it up into shallow convective clouds called stratocumulus. Up-close view of water particles forming fog. 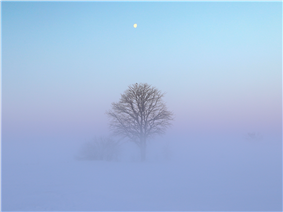 In the western United States, freezing fog may be referred to as pogonip. It occurs commonly during cold winter spells, usually in deep mountain valleys. The word pogonip is derived from the Shoshone word paγi̵nappi̵h, which means "cloud". In The Old Farmer's Almanac, in the calendar for December, the phrase "Beware the Pogonip" regularly appears. In Smoke Bellew Jack London described Pogonip which happened to the main characters, killing one of them. Frozen fog (also known as ice fog) is any kind of fog where the droplets have frozen into extremely tiny crystals of ice in midair. Generally this requires temperatures at or below −35 °C (−31 °F), making it common only in and near the Arctic and Antarctic regions. It is most often seen in urban areas where it is created by the freezing of water vapor present in automobile exhaust and combustion products from heating and power generation. Urban ice fog can become extremely dense and will persist day and night until the temperature rises. Extremely small amounts of ice fog falling from the sky form a type of precipitation called ice crystals, often reported in Barrow, Alaska. Ice fog often leads to the visual phenomenon of light pillars. Tree in field during extreme cold with frozen fog. Arctic sea smoke is similar to sea smoke, but occurs when the air is very cold. 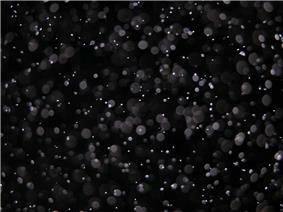 Instead of condensing into water droplets, the water vapor desublimates directly into ice crystals. Garua fog near the coast of Chile and Peru, occurs when typical fog produced by the sea travels inland, but suddenly meets an area of hot air. 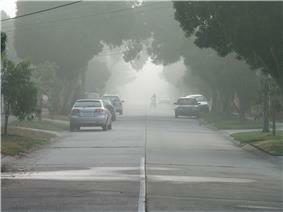 This causes the water particles of fog to shrink by evaporation, producing a "transparent mist". Garua fog is nearly invisible, yet it still forces drivers to use windshield wipers because of deposition of liquid water on hard surfaces. 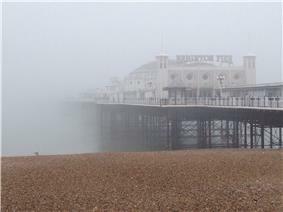 rightSea fog or "fret" encroaching on Brighton pier. Sound travels best through solids, then liquids, then atmosphere (air). Since fog is a concentration of water droplets, sounds within the range of a fog condition will be amplified compared to the same sounds made without the presence of fog. Also, most Fogs involve the formation of a temperature inversion. Temperature inversions can increase the distance that sounds can travel by reflecting a sound between the ground and the inversion. The presence of a high pressure and a temperature inversion during the Buncefield oil depot explosion allowed the sound of the explosion to be carried more than 200 miles to Belgium and the Netherlands. Redwood forests in California receive approximately 30-40% of their moisture from coastal fog. Change in climate patterns could result in relative drought in these areas. Some animals, including insects, depend on wet fog as a principal source of water, particularly in otherwise desert climes, as along many African coastal areas. Some coastal communities use fog nets to extract moisture from the atmosphere where groundwater pumping and rainwater collection are insufficient. Armies have advanced under fog to hide their movements from the opposing forces. Artificial fog is man-made fog that is usually created by vaporizing a water and glycol-based or glycerine-based fluid. The fluid is injected into a heated block, and evaporates quickly. The resulting pressure forces the vapor out of the exit. 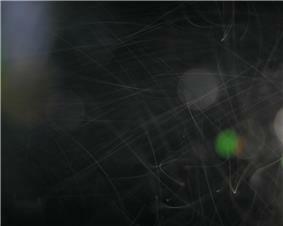 Upon coming into contact with cool outside air, the vapor condenses in microscopic droplets and appears as fog. The foggiest place in the world is the Grand Banks off the coast of Newfoundland, the meeting place of the cold Labrador Current from the north and the much warmer Gulf Stream from the south. Some of the foggiest land areas in the world include Argentia (Newfoundland) and Point Reyes (California), each with over 200 foggy days per year. Even in generally warmer southern Europe, thick fog and localized fog is often found in lowlands and valleys, such as the lower part of the Po Valley and the Arno and Tiber valleys in Italy; Ebro Valley in northeastern Spain; as well as on the Swiss plateau, especially in the Seeland area, in late autumn and winter. Other notably foggy areas include Hamilton, New Zealand; coastal Chile (in the south); coastal Namibia; Nord, Greenland; and the Severnaya Zemlya islands. Fog partially obscuring a mountain. ^ Use of the term "fog" to mean any cloud that is at or near the Earth's surface can result in ambiguity as when, for example, a stratocumulus cloud covers a mountaintop. An observer on the mountain may say that he or she is in a fog, however, to outside observers a cloud is covering the mountain. "Standard practice for the design and operation of supercooled fog dispersal projects" Thomas, P. (2005) p. 3. ISBN 0-7844-0795-9 See Google Books. Accessed 2010-08-01. Further distinguishing the terms, fog rarely results in rain, while clouds are the common source of rain. ^ "Federal Meteorological Handbook Number 1: Chapter 8 – Present Weather". ^ "Fog – AMS Glossary". Retrieved 16 March 2013. ^ Robert Penrose Pearce (2002). Meteorology at the Millennium. Academic Press. p. 66. ^ Bart van den Hurk and Eleanor Blyth (2008). "Global maps of Local Land-Atmosphere coupling". KNMI. Retrieved 2 January 2009. ^ Krishna Ramanujan and Brad Bohlander (2002). "Landcover changes may rival greenhouse gases as cause of climate change". ^ Dr. Michael Pidwirny (2008). "CHAPTER 8: Introduction to the Hydrosphere (e). Cloud Formation Processes". Physical Geography. Retrieved 1 January 2009. ^ Glossary of Meteorology (June 2000). "Front". ^ David M. Roth (14 December 2006). "Unified Surface Analysis Manual". ^ FMI (2007). "Fog And Stratus – Meteorological Physical Background". Zentralanstalt für Meteorologie und Geodynamik. Retrieved 7 February 2009. ^ Miles, Kathy (October 2007). Just About Everything You Wanted to Know about Fog. Starryskies.com. ^ Allred, 2009, p. 99. ^ Frost, 2004, p. 22. ^ a b "Pogonip - Definition from the Merriam-Webster Online Dictionary". Retrieved 2009-02-14. ^ "Pogonip - Definition from the Dictionary.com". Retrieved 2013-01-02. ^ Cowling; Richardson; Pierce, 2004, p. 192. ^ "Fog Fluctuations Could Threaten Giant Redwoods". ^ Karukstis; Van Hecke, 2003, p.23. ^ "Q: What are some of the foggiest locations in the world?". USA Today. Lu C., Liu Y., Niu S., Zhao L., Yu H., Cheng M. (2013). Examination of microphysical relationships and corresponding microphysical processes in warm fogs , Acta Meteor. Sinica, 27(6), 832-848. Lu C., Niu S., Tang L., Lü J., Zhao L., Zhu B. (2010). Chemical composition of fog water in Nanjing area of China and its related fog microphysics , Atmos. Res., 97(1-2), 47-69. Allred, Lance (2009). Enchanted Rock: A Natural and Human History. University of Texas Press. Cowling, R. M., Richardson, D. M., Pierce, S. M. (2004). Vegetation of Southern Africa. Cambridge University Press. Gleissman, Stephe (2007). Agroecology: the ecology of sustainable food systems. CRC Press. Karukstis, K. K., Van Hecke, G. R. (2003). Chemistry connections: the basis of everyday phonemena. Academic Press. Marshall, T., Hoadley, D. (1995). Storm Talk. Tim Marshall.